Then you can insert Unicode characters without memorizing their hex values. Of course, you must memorize the Compose key sequences. Fortunately, they’re more-or-less mnemonic for the ones I occasionally use, which are hereby cherrypicked from that list. If you set the keyboard layout to US International With Dead Keys, maybe you (definitely not I) could remember all the dead keys. This entry was posted on 2016-11-16, 07:25 and is filed under Science, Software. You can follow any responses to this entry through RSS 2.0. Both comments and pings are currently closed. I use US International with AltGr dead keys combined with the compose key. That way characters like é, ï, ç, ß and the like are easily accessible. It’s probably more important for me as a Dutch person who at least semi-regularly types four languages, although usually only two or three. But in any case several accented characters are also important in Dutch, even if ç and ß aren’t. I’ve always found http://web.archive.org/web/20140311204348/http://www.hermit.org/Linux/ComposeKeys.html perhaps more useful than looking in the actual keyboard configuration file. I’m pleased to report that my compose key doesn’t produce any idiotic poo. What I miss is some kind of easy IPA typing without resorting to one of the various solutions like http://ipa.typeit.org/ (however nice that may be). Admittedly I’ve never missed it enough to investigate properly. Btw, I prefer to use Caps Lock as Compose. That definitely shows of the limitations of current keyboards; that, and Chinese all by itself. I need a few Greek letters for engineering units and the occasional odd symbol, nothing more. At least they’ll be easier to find now. And, yeah, the poo is idiotic; I had to include that sequence when I saw it in the table. Surprise: the glyph appears in the browser font! It’s not in my console font, though, where it renders as a simple lowercase o. Now if you want to type Cyrillic or some such it would be a little bit more complicated because you’d have to learn and switch layouts. Oh, no, you don’t! I am not messing with the X input magic, lest I become crunchy and go well with ketchup. As an aside, I learned of some new, not-quite obsolete machines on Dell’s pre-black-Friday-sale promotion. Ordered a 15″ Inspiron i3; 500gig HD, 4 g RAM (wanted 8, will upgrade when I know what to buy), all for $329 with shipping. It’ll be my first modern machine on Linux (Slackware, so far.) I was going to spend that or more on an offlease, so this looked attractive for my needs. That will be my on-the-road machine, and will let me get stuff to/from the barn/shop via sneakernet. I don’t know where the master association file lives, but you can set ’em one by one, which may be Good Enough. Fire up Thunar (the file manager) and other-click on a file name to get a list of things-to-do. 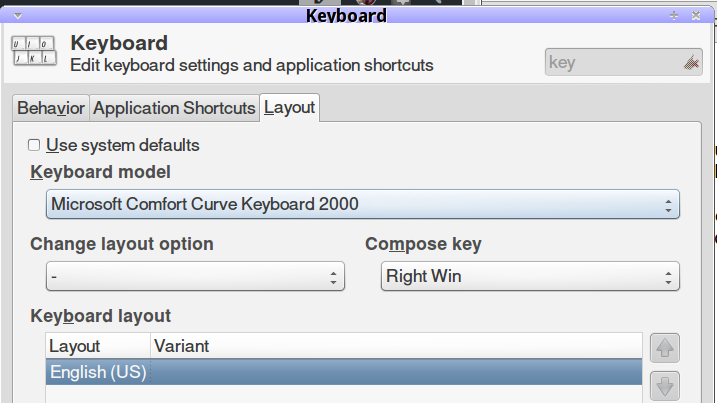 The first option fires off the default program and the second option (“Open With”) gives you a menu of possibilities. Click “Open With” and select the last entry (“Open with other application …”), pick whatever program you like, check the “Use as default for this kind of file” box, and you’re all set. Not what I’d call obvious, fer shure! I think it’s probably ~/.config/mimeapps.list. Given a big enough clue, I found /home/ed/.local/share/applications/mimeapps.list, but I’d rather not hand-edit that thing, even to make block changes, for fear of wandering off into the bushes. Linux configuration has become quite a mess. Selah. If only there were one “system”! It seems we have multiple overlapping layers of configuration files, scattered in a wide variety of locations, with overrides tucked away in other places. For example, I got used to finding system config files in /etc, but now the master copies live in /usr/local; some of them, I think, anyway. Then dot-files moved from ~ to ~/.config and now, apparently, to ~/.local. ~/.local/share is for “user specific data files”. Some developers seem to have misinterpreted this to mean configuration, but it’s meant to be analogous to /usr/local (for that see http://refspecs.linuxfoundation.org/fhs.shtml). That means stuff like binaries, libraries, and icons. Not configuration, although in the sense of default configuration I suppose there could be some overlap with /etc. User configuration overriding the default configuration should go in ~/.config. True, logically it would probably make more sense if .config were a subdirectory of .local or maybe vice versa. I have no idea how it grew to be this way; it was this way when I got here. :P But aren’t you exaggerating the problem a little bit? For me almost everything resides in .config these days besides a bunch of imo annoying stuff like .firefox and .qalculate, which, yes, I think should move over into .config already. Stuff that can be found in .local/share is e.g. fonts, icons, paint brushes, etc. which makes sense because they aren’t configuration but “user data”. I suppose you could argue about whether or not they should be split up, but I think the documents I linked clearly explain the system behind it. That there are a few deviant programs that stick to ~ or put some inappropriate stuff in .local/share is a pity. Now systemd I don’t like. I can’t even figure out how to read the logs without doing an Internet search. Much like the Windows registry. I want text files, and preferably not in an XML or JSON format either. I think that the “omg, everything is a text file!” eureka moment is probably one of the defining aspects of Linux for anybody first playing around with it or some other Unix-like system. Stuffing all the (text!) config files into ~/.config makes perfect sense: I’m highly in favor of it. Now, let’s have everybody actually do that and move on. I want text files, and preferably not in an XML or JSON format either. IIRC, Linux really wasn’t better in the 90s and there’s no way to herd all the code-writing cats in one direction, but discovering that everything I (think I) know has become obsolete every time I update a system tends to produce a certain lack of enthusiasm for The New Shiny. a) That was because years ago Windows insisted on no GPT on a BIOS motherboard… and I recently learned it insists on the opposite on an EFI motherboard. b) Windows ran fine for half a year before it pulled the trigger. Wouldn’t do anything. Even a repair install fixed nothing. Linux doesn’t care. It basically just runs no matter what you do. My current install has migrated across several motherboards, HDDs and SSDs. I still have GWX control panel on my desktop, in case MS really decides to pull another Windows 10 bit. The Dell laptop that’s coming Real Soon Now will be my crash-test-dummy for the latest version of Slackware; trying 64 bit this time. If all goes well, we’ll keep one laptop as a Token Windows Box, kept offline, and in Woody Leonard’s Group C (never update, nohow), aka Group W (for the Arlo Guthrie fans). For the latter, I have to fiddle with the DNS to keep it from the ‘net, while using a HOSTS file to let it find the printer. PS: mucking with properties in a pdf file got Xpdf to be the dafault for all pdf files. Last I heard, Slack hadn’t succumbed to the temptations of systemd. I hope.